The Unrepresented Nations and Peoples Organization (UNPO), in collaboration with several Balochi and Sindhi human rights and youth organizations, organized a protest against gross human rights violations related to the brutal implementation of the China-Pakistan Economic Corridor (CPEC). The protest took place on 28 August 2016 at 2pm, in front the Chinese Embassy in London (Portland Place, W1B1QD London). 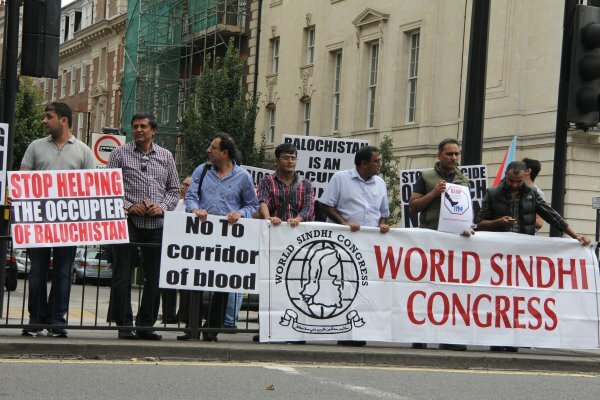 The chairman of the World Sindhi Congress, one of the UK-based activist groups that co-organised the protest with UNPO, Lakhumal Luhana told the Hindustan Times that this massive trade and transit project was responsible for “gross human rights violations” adding that with no plans for rehabilitating, thousands of people would be displaced by the CPEC. The CPEC will be imposed by Islamabad on the Balochistan and Sindh provinces and on Pakistan-occupied Gilgit-Baltistan, whose inhabitants have not been asked for consent. 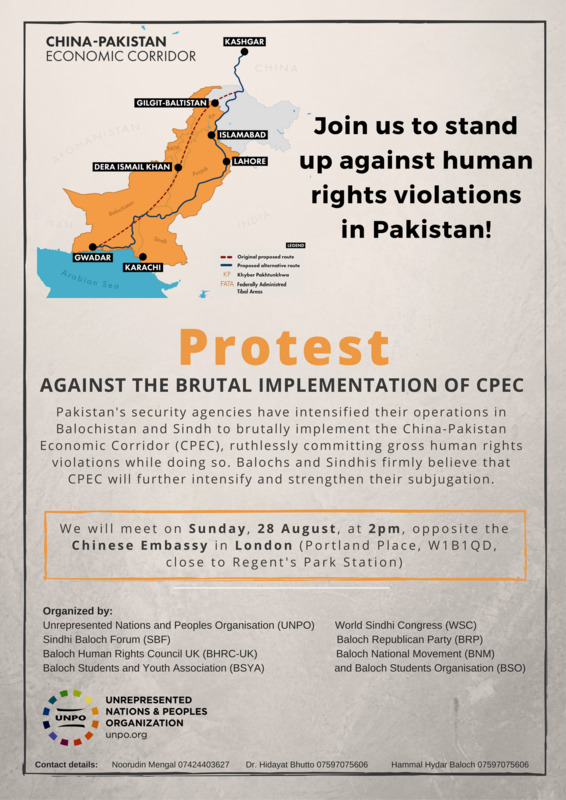 Before the protest, a memorandum was sent by post to the Chinese embassy, describing Balochistan as an “occupied territory” stating that the CPEC is aiming to bring demographic changes by bringing 2.5 million people from other regions of Pakistan to the province, which activists feared will make the Sindhis a minority in their own region. The protest was the latest of several protests that have recently taken place in Pakistan and abroad. “Prime Minister Narendra Modi for Balochistan” and “No to CPEC” were two of many slogans shouted during the protest. Alongside a plethora of placards, activists also exclaimed how Balochistan’s abundant resources were being diverted for the benefit of the Punjab province. The protest was shortly followed by a statement from Narendra Modi during an all-party meeting that Pakistan would have to answer for the atrocities in Balochistan. Modi focused on the Baloch nationalist movement to highlight issues such as human rights violations and enforced disappearances. The CPEC has been described as an economic “game changer” by Pakistan and China, but the protesters believe it would only prolong and intensify their subjugation, and could not idly stand by as the plans went along. Already to clear the land for CPEC Pakistani security agencies have intensified operations, committing gross human rights violations in Balochistan and Sindh. 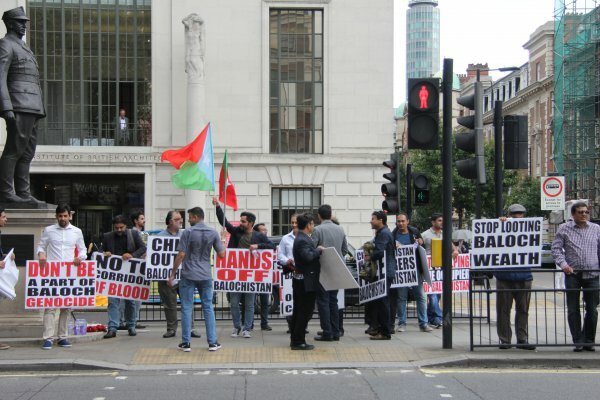 Noordin Mengal, Baloch human rights campaigner, said during the protest that China and Pakistan want to scare and oppress the Balochi community, and whilst they are still profiting from the project, they will have no sympathy whatsoever for anybody it may impact negatively. This text is largely based on an article published by Hindustan Times.